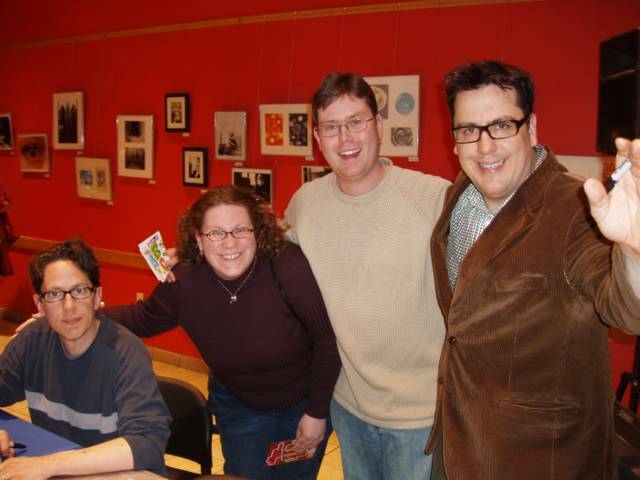 (l. to r.) Linnell, Erin (and Liam, in utero), me, Flans. We went to a free They Might Be Giants show tonight at the Borders location in Providence tonight. The Johns were there promoting their new kids' record, Here Come the ABCs, so it seemed like the perfect opportunity to take Liam to his first concert (even if he is still just a fetus). I've been a big fan of the group for years, but this is the first time I've ever actually been able to see them live, and it was definitely worth attending. We (and most of the crowd) were expecting mostly stuff off of the new album, but were pleasantly surprised when they worked old favorites like "Istanbul (Not Constantinople)," "New York City," "Doctor Worm" and "Particle Man" into the short set. The crowd made the show a lot of fun, full of kids dancing and bopping around on their parents' shoulders. If you don't think that's the cutest thing ever, then you have a cold, dead heart, my friend. What did I buy this week? Glad you asked. Old Comics Week Gone Wild! Who's On First - 2K5 Edition! By Jove, I think they've got it!